The Great Sphinx (أبو الهول‎) of Giza, commonly referred to as the Sphinx, is a limestone statue of a reclining or couchant sphinx that stands on the Giza Plateau on the west bank of the Nile in Giza, Egypt. 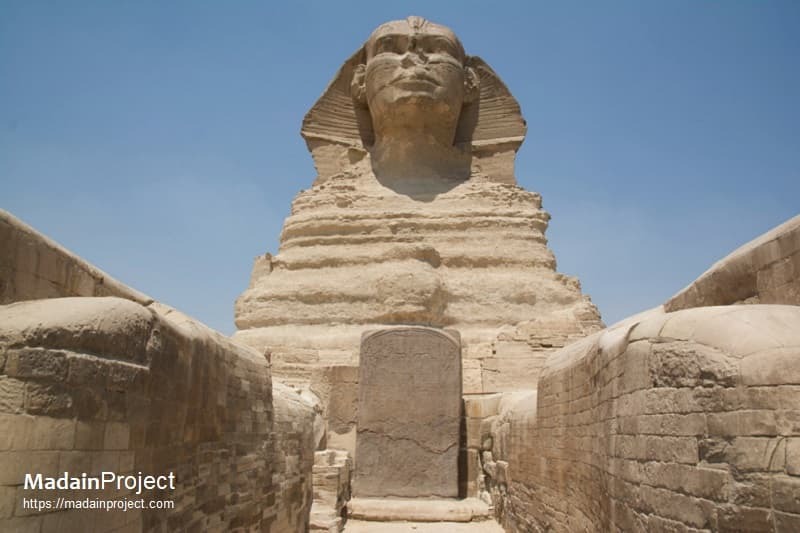 The Great Sphinx is one of the world's largest and oldest statues, but basic facts about it are still subject to debate, such as when it was built, by whom and for what purpose. Cut from the bedrock, the original shape of the Sphinx has been restored with layers of blocks. It measures 73 metres (240 ft) long from paw to tail, 20.21 m (66.31 ft) high from the base to the top of the head and 19 metres (62 ft) wide at its rear haunches. The Dream Stele, is an epigraphic stele erected between the front paws of the Great Sphinx of Giza by the Ancient Egyptian Pharaoh Thutmose IV in the first year of the king's reign, 1401 BC, during the 18th dynasty. As was common with other New Kingdom rulers, the epigraph makes claim to a divine legitimisation to pharaohship. At some unknown time the Giza Necropolis was abandoned, and the Sphinx was eventually buried up to its shoulders in sand. The first documented attempt at an excavation dates to c. 1400 BC, when the young Thutmose IV (1401–1391 or 1397–1388 BC) gathered a team and, after much effort, managed to dig out the front paws, between which he placed a granite slab, known as the Dream Stele. A number of shafts or tunnels are known to exist within or below the body of Great Sphinx at Giza. 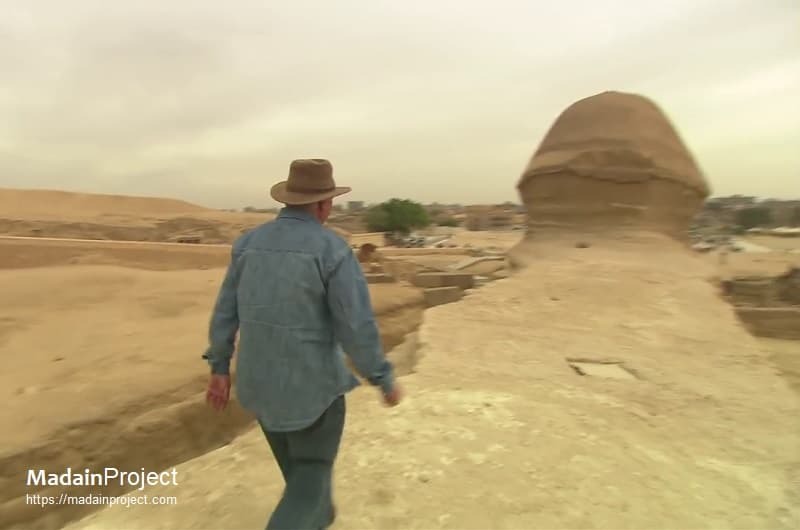 Zahi Hawass (pictured here) approaches a small square lid of a shaft, believed to have been dug by treasure hunters at some point in antiquity. At least three other shafts, one at the top of the Sphinx's head and two on it's flanks are known to exist.